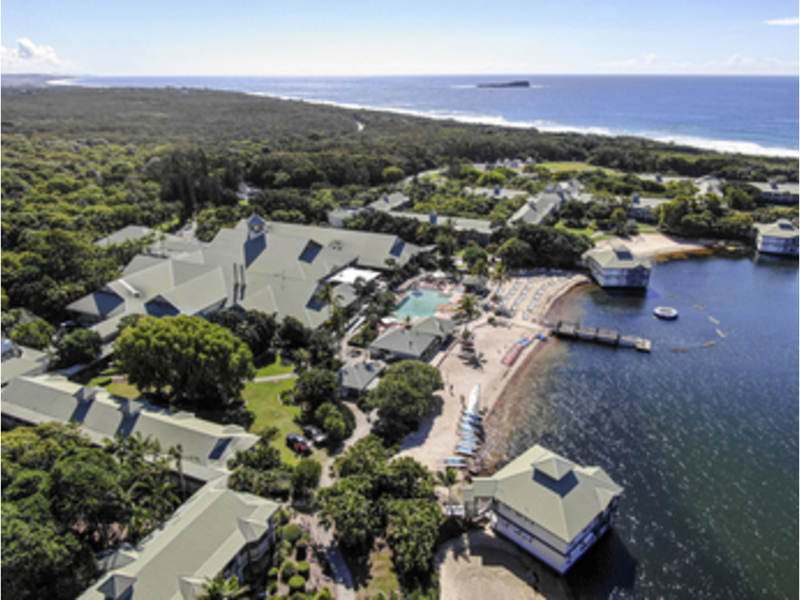 Unwind between river and ocean in family-friendly 4-star comfort at Novotel Twin Waters Resort Sunshine Coast. Start your day fresh with a lavish buffet breakfast overlooking the lagoon. Indulge yourself with a luxurious spa treatment while the kids have fun on the floating trampoline, kayaking or in the pool at Novotel. With its spectacular beachside location, Novotel Twin Waters Resort provides the ideal base for guests looking to explore the Sunshine Coast. Guests staying at this impressive Sunshine Coast hotel are within easy reach of Australia Zoo, SeaLife & more. The conference & event facilities at our Novotel Sunshine Coast accommodation are extensive, with 10 meeting spaces to accommodate from 10-1,400 delegates. A new purpose built convention centre will be coming to our Twin Waters accommodation in May 2019. Within easy reach of Maroochydore, Novotel Twin Waters Resort provides the ideal base for exploring the Sunshine Coast. Guests can discover Underwater World, Australia Zoo, Mudjimba Beach, Coolum Beach, Eumundi Markets and the Sunshine Coast hinterland. Visitors looking for hotels in the Sunshine Coast can choose from an extensive selection of accommodation options at Novotel Twin Waters Resort. This impressive Sunshine Coast hotel features 361 guest rooms and suites, each offering everything needed for a relaxing stay. Spacious and tastefully appointed, each room provides a peaceful retreat, featuring comfortable bedding, air-conditioning, a TV with pay-per-view channels and room service ordering, tea and coffee facilities and an ensuite. An innovative takeaway option. Orders can be phoned through and collected at the entrance to Nouveau Restaurant. Served in takeaway containers, the food can be enjoyed anywhere around the resort. Room delivery is available for an additional fee. The Deli Cafe is centrally located in the main foyer. The Deli offers a large range of grocery products, a bottle shop selection and a range of fine coffees and teas. The flair of our pastry chef is reflected in the delicious savories and pastries. The activity centre of the resort, Aqua Lounge + Bar is a stylish sports bar which offers an all day snack menu. It is the ideal place to catch up on recent sporting activities with friends. We went up for one night and love the place. We were allowed to use the facilities before and after checking out. Over the years they've stopped some of the free activities, like bike hire, windsurfing and archery, but there's still a lot to do. The kids and I loved the water activities like the trampoline and rocknroll. Also, the catamarans and kayaks were heaps of fun. The kids activities were good and the staff were very friendly. The only downside was that as an Accorplus member this is the only 4 days in a row that we couldn't use the discount card on food. The card costs us $300 a year so that was disappointing as a lot of places seem not to honour it so to find one that does and then not be able to use it was a downer. I heard another group complain bitterly when they found out at the resort that it couldn't be used. Why not be like the shops and just not allow it on Friday and Sunday? We also were gifted a few tokens to the games room on a previous visit, but not this time. I'm not sure if it was for Accor Plus or Accor Vacation Club but as members of both, we didn't receive any this time. As Accor Plus Silver, we had a complimentary drink which was extremely nice and we ordered a wonderful Chip-a-holic dish while we sat and had our drinks. Overall a great place to go and staff are great. To be picky, there was not enough milk for coffee in the room, not enough seats (1 inside and 2 outside for a room for 4 people) but I love the touches like cold water and apples in the lobby. Free activities are also wonderful like the ping pong in the lobby. We had a lovely time away and will be booking again. We spent 2 nights at your hotel. Checked in to a room on the ground floor facing the garden. The room is good size for 2A and 2C. However, the room is not very clean for eg. dusty bed side table and floor is dirty. Not to mention there are some dead mozzies on the wall. Quite disgusting. The shower head has low water pressure. The rooms are old looking and seriously need upgrade. Overall, we had a good time checking out the water activities and spending time at hotel common facilities. We had a wonderful mini holiday. Wish it was longer! My husband and I and our 2 kids had a wonderful time. The activities were all enjoyable including the beach games. Room was comfy. Love the $15 credit option for not getting room serviced. Breakfast buffet was fantastic. The weather wasn't perfect but no one can control that! Very relaxing to walk around the resort. Loved seeing the kangaroos and birds roam freely. Water activities on the lake was lots of fun for the whole family. Short walk to the beach was nice too. Not great at all except the Breakfast was really good. I was working as a Volunteer for the RACQ LifeFlight Annual Gala Ball & working to a strict timetable. I was excited when I learned that I was in a Resort Suite which I intended to take full advantage of when I had my 2 hour break between 2:00pm & 4:00pm. This did not happen as my room was not ready until 3:45pm which did not leave me much time to dress for the event and get back on site after starting the day at 7:00am & also knowing that it would be a very late night. When an company knows that it will be busy, as there were functions the night before, you would think that extra staff would be rostered on as it was also the start of the school holidays. The one bonus was that the staff that were working were very friendly. Very relaxed environment. Lovely grounds. Better lighting in our room would have made the stay better. No lighting in the main area of the room other than a bedside lamp. Pretty good but room looking a bit tired especially bathroom and there should be a safe in the room and in this day and age FREE wifi. Stay was pretty good but Awe couldn’t believe that wifi wasn’t free. We travel the world and haven’t paid for wifi in years and certainly wasn’t about to start paying now. Very disappointing. Also there should definitely be a safe in the room. It was good as expected, however not as much on offer as our stay 12 months ago. Experience was good and service was good as per usual. We were disappointed to see the inflatable water park had gone since our last stay 12 months prior, and also last time the pop up dining on the other side of the lagoon was also there which was also disappointing to see it had disappeared. We had a lovely week, the staff were very friendly, hotel was nice but facilities a little tired - could do with an update. Would have been better without the rain! Overall a really nice resort to stay at. Only downside is the entertainment for teenage kids when the weathers not good. I thought the $10 ticket for a pretty poor games room with a little steep. A free larger games room is needed on those horrible days as it can get very boring for the kids. Also, I would have loved a toaster in our room as the food options aren’t great. Was sick of eating fried food after a few days and a toaste with butter would have been good. A broom in the room would also have been handy, the amount of sand and dirt entering the room on a daily basis daily room cleaning wasn’t enough for me. Room was not ready on time on arrival, Especially the F&B very disappointing Fist day we had an antipasto in the bar until the room is ready, it was of a poor standard so we gone out for dinner and BF We then used ones more the restaurant similar experience. so easy to stay here with children and fun. Loved all the activities and how close the location to is to everything else on the coast. So great! Enjoyable family holiday. All staff were particularly welcoming and friendly towards children. I held my 40th here with all my family and friends and all of our expectations were exceeded. My children and I always stay at Novotel wherever we can. On this occasion we were given an upgrade because for no apparent reason money was “accidentally” taken out of my account (by the hotel staff). They were apologetic and said we could be moved to a King Suite. This occurred after I had paid for accomodation. So knowing we were in a king suite I brought food, condiments, snacks etc as we always stay in king suites at Novotel Nusa Dua. I was shocked when I walked in the door and noticed there was no cooking facilities - nor a fridge big enough for the food I had brought . In addition, the room was tiny in comparison to what we were used to. Long story short I had to throw out everything frozen, and was out of pocket $600 because we didn’t have cooking facilities and had to purchase food. Overall it was a disappointing experience and I will reconsider if we will stay at Novotel twin waters again.